Frederick Banting was raised in the Methodist faith in Alliston, Ontario, his parents even hoping that he would become a minister. Instead, he became a Nobel Prize winning doctor, famous for his co-discovery of insulin. This brilliant doctor was also a gifted artist, who began to paint in the 1920s while starting his medical practice. Joining Toronto’s Arts and Letters Club, he came in contact with the Group of Seven, and his friendship and sketching trips with Group member A.Y. Jackson sparked an exponential leap in his development. Traveling to the Arctic, Quebec and northern Ontario, they shared an easy camaraderie, a love of the land and its people and a keen interest in the aesthetics of painting. 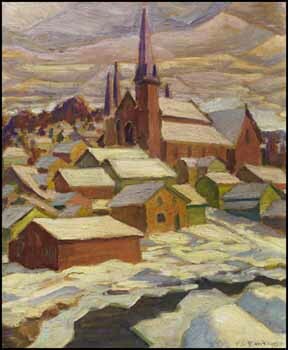 Methodist Church, Port Hope is a striking, layered composition possessing fresh colour and strong patterning in the snow, rooftops and clouds; its strong focal point the stately church at the heart of the town. Due to Banting’s career as a doctor and his untimely death at the age of 49, his extraordinary artistic output was limited, and the rarity of his works makes them all the more sought after by collectors.